@ Junagad, Gujarat. Established in 1965. Only abode of the Asiatic Lions. 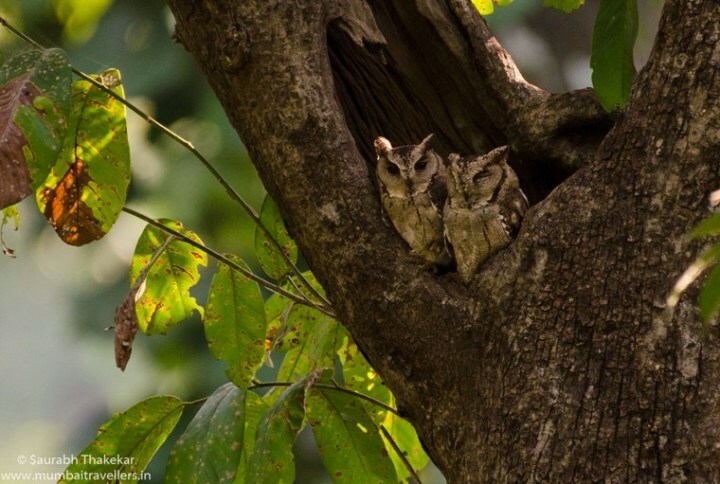 Famous for – Lions, Leopards, Birding, Maldhari Community. The Gir National Park and Wildlife Sanctuary (also known as Sasan-Gir) is a forest and wildlife sanctuary in Gujarat, India. It is sole home to Asiatic Lions in the World. It was established in year 1965 with total area of 1412 sq km. Gir National Park is divided into two parts Gir Wildlife Sanctuary and Devalia Safari Park which is also called as Gir Interpretation Zone. Devalia safari Park remains closed every Wednesday. And overall park is closed in monsoons i.e 16th June to 30th October. The peak season for safaris start from November and ends in June. Pick up from Rajkot/Junagarh at 07:30 am and transfer to Gir national park in private car. Check in and rest. After Lunch Gear up and Leave for 1st Wildlife Safari. Evening Back to Resort. Dinner. Lights off and day ends. Early Morning Leave For 4th Wildlife Safari. Check Out luggage. Enjoy the delicious Lunch and post Lunch Leave For Junagarh/ Rajkot airport/ junction by Private Vehicle. Gir boasts of dry deciduous forests with grassy meadows and shrubbery. More than 400 species of plants are recorded here. Teak is majorly found along with different species of Acacia. Other flora seen here is Jamun, Ber, Karanj, Banyan etc. There are also areas of the park with open scrub and Savannah-type grassland. 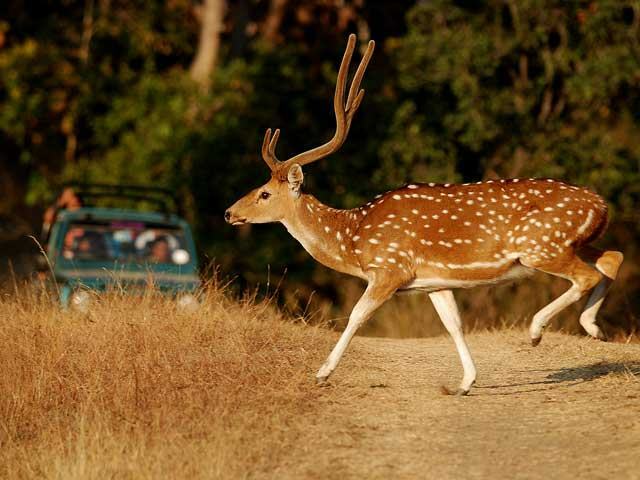 The most-sighted animal in the park, the Chital, or Indian spotted deer, inhabits the dry and mixed deciduous forest, with a population of over 32,000. Other deer species seen are Sambar deer. Antelopes are also seen here like Chinkara, Nilgai, Chausingha etc. Along with the famous Asiatic Lion, other cats like Leopards,Jungle cats,Rusty spotted cat is seen. Desert cat is another elusive cat which is observed rarely. Striped hyenas, golden jackals, Indian mongoose, Indian palm civets, and honey badgers are also seen. Marsh crocodile, Monitor lizards, Tortoise etc are also seen. Snakes like pythons, kraits, viper are observed. Gir has more than 300 species of birds, most of which are resident. The scavenger group of birds has 6 recorded species of vultures. Some of the typical species of Gir include crested serpent eagle, endangered Bonelli’s eagle, crested hawk-eagle, brown fish owl, Indian eagle-owl, rock bush-quail, Indian peafowl, pygmy woodpecker, black-headed oriole etc. Asiatic Lion (Panthera leo persica) was once found all over South and South east Asia. Posts 19th century, the population declined alarmingly due to loss of habitat, hunting and destruction of forests until only 20 individuals were recorded. 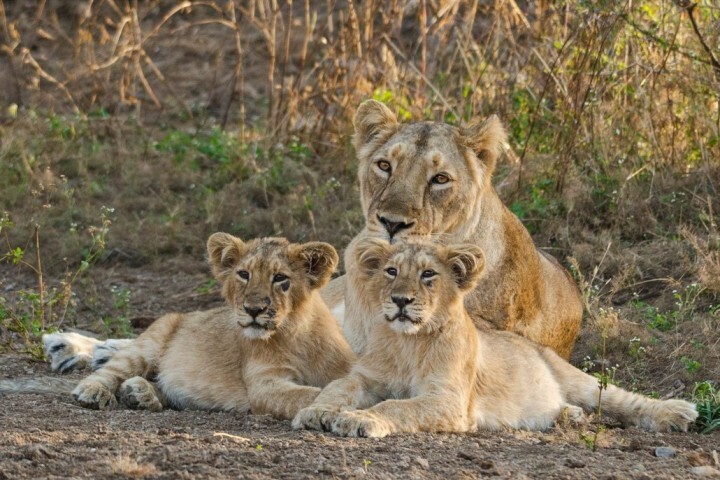 The conservation efforts of Nawab of Junagadh brought back lions to life and today there are about 525 lions in Gir. It is listed as Endangered species by IUCN. Asiatic lions are slightly smaller than African lions. Adult males weigh 160 to 190 kg (350 to 420 lb), while females weigh 110 to 120 kg (240 to 260 lb).The height at the shoulders is about 3.5 ft. The most striking morphological character, which is always seen in Asiatic lions, and seldom in African lions, is a longitudinal fold of skin running along its belly. Only male lions boast manes, the impressive fringe of long hair that encircles their heads. Life span is about 16-18 years they are usually seen in prides or groups. The females are seen together along with cubs whereas male remains somewhat solitary. 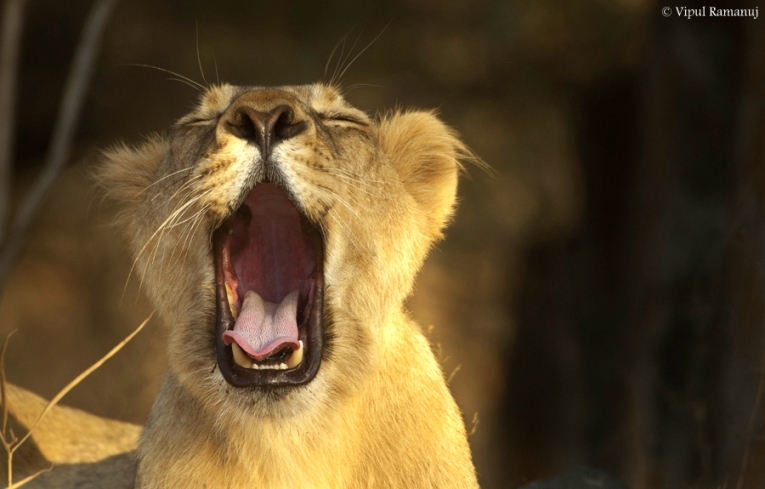 Female lions are the pride’s primary hunters. They often work together to prey upon large mammals. RAJU, the Asiatic lion is one of the famous lion of Gir. He is most photographed and was loved by all nature lovers alike. He died in 2015 due to old age. One can either enjoy the safari in Gir National Park or Devalia Zone. Safari booking at Gir National Park is controlled by the Dept. of Forest,Gujarat (Govt. of India). One has book the safari permit online. All the detail of Travelers must be filled / checked in boxes asked in detail form. Proof details must be entered with valid identity card. Large numbers of options are available for accommodation. Right from budget stay to 4 star luxury resorts are available for tourists. The forest department dormitories and resthouses are also available. 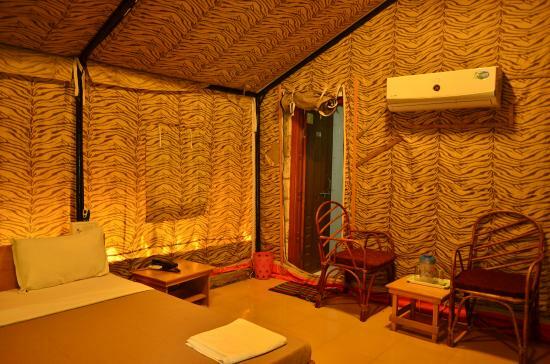 Budget hotels : Gir birding lodge, Gir cottage villa etc. Luxury hotels : Lords resort, Asiatic Lion Lodge Lion Safari Camp etc.